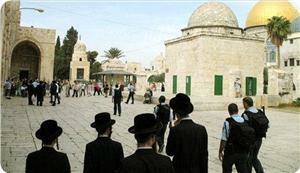 A group of Jewish fanatic settlers broke into al-Aqsa Mosque on Sunday morning through Maghareba gate under protection of Israeli special police forces. SAFA news agency quoted the media director at the Aqsa Foundation for Endowment and Heritage as saying that 25 settlers toured the Mosque’s courtyards. He noted that hundreds of Quran students were inside the Mosque since the early morning hours amidst heavy deployment of Israeli policemen at its various gates. The Israeli occupation authorities have recently facilitated the repeated entry of Jewish settlers and officials into the holy site in preparation for declaring its temporal and spatial division between Muslims and Jews. 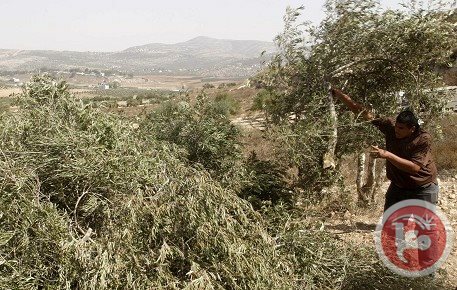 Israeli settlers from Beit Aain and Jaboot settlements uprooted several dozen of olives trees on Saturday in Nahaleen village ,southwest of Bethlehem in the West Bank. 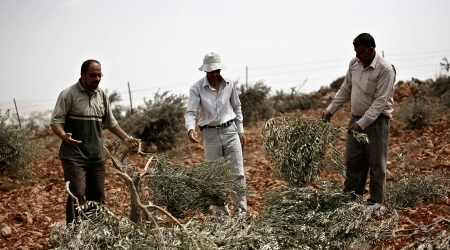 The activist Ghassan Najajrah said that the settlers uprooted 54 olive trees , their ages between ( 20-30) years, pointing that this is not the first time the israeli settlers attacked this land and other lands of Nahaleen. The trees were belonged to farmers of Abo Fanon family. Israeli settlers also wrote anti-Arab slogans on the rocks of Nahaleen lands. In recent but not last incidents, the car of Acre resident Hassan Sobach vandalized Saturday at a parking lot near Nahal Hashofet , in the north of occupied Palestine. The vehicle's tires were punctured and graphitized with the words "price tag" and a Star of David. "I came with my family to tour the area," Sobach said. "We had a good time, but the end of the day was very disappointing. The situation is bad; we hear about price tags on a daily basis and there is no one to stop the perpetrators." Sobach explained that the Israeli occupied authorities have not put an end for such attacks carried out by extremist Jews and settlers. "The sad part is that it could happen repeatedly. It's about time someone stopped these lawbreakers," he said. The incident is the latest in a series of similar attacks over recent weeks that have spread into areas inside pre- 1948 occupied Palestine. 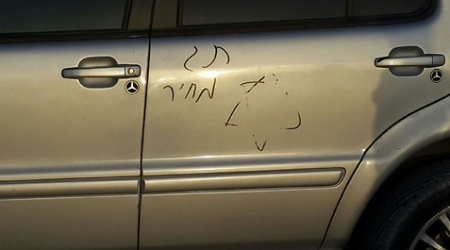 On Tuesday, the tires of dozens of vehicles were slashed in Fureidis, and a Star of David and the writing 'Close mosques, not yeshiva' was spray-painted on the wall of the town's mosque. “Price tag” is a term used to describe acts of vandalism and violence associated with the settler movement in retaliation for Palestinian attacks and to protest what they perceive as the Israeli government’s pro-Palestinian policies. 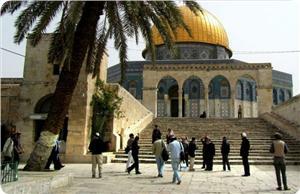 Mosques, churches, dovish Israeli groups. Dozens of Israeli soldiers invaded, on Saturday at dawn [May 3, 2014], the northern West Bank city of Nablus, the Balata refugee camp, and nearby communities; one soldier was reportedly injured during clashes with resistance fighters in Balata. Eyewitnesses said dozens of soldiers invaded the city, and drove in its streets before invading Balata for the second time in less than twelve hours, and that the army fired dozens of rounds of live ammunition during the invasion. Israeli sources claimed the army located, during its invasion into Balata, two tunnels loaded with weapons and ammunition. The sources added that a commander of the Nahal Brigade of the Israeli army was mildly injured in the camp, as the army was breaking into and searching dozens of homes. According to the state-run Israeli Radio, soldiers of the Nahal Brigade initiated a large-scale invasion into Balata searching for Palestinian fighters, largely in regard to an incident in which Palestinian gunmen opened fire at the commander’s vehicle, just two days ago. It added that the commander was injured by a homemade explosive that detonated near him when fighters hurled the explosive at him as he, and other soldiers, occupied a rooftop in the refugee camp. The army concluded its invasion into the refugee camp during the morning hours, Saturday. In addition, clashes took place on Saturday, at dawn, when several Israeli military jeeps invaded various neighborhoods in Nablus. Soldiers also kidnapped one Palestinian at Za’tara roadblock, south of Nablus. 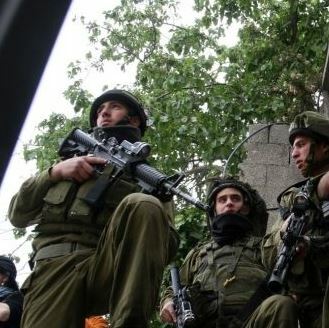 Another invasion was carried out into the an-Naqoura village, west of Nablus, while a number ofl Israeli settler militants also invaded the village, local sources said. Several military vehicles also invaded Aseera al-Qebliyya village, near Nablus, while the soldiers also broke into and searched several homes after detonating their doors, causing property damage. 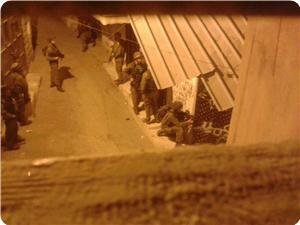 Local sources said the soldiers detained and interrogated several Palestinians in the village, to withdraw later on. An Israeli army brigade in the northern West Bank has called on Israeli settlers to join the “independence festivals”, scheduled for next Tuesday, in which the proverbial ribbon will be cut for a new housing unit to be opened in Hawara military camp, south of the West Bank city of Nablus. Leaflets and advertisements were distributed in various settlements of the northern West Bank for this purpose. In addition to the call for participation in entertainment events, the leaflet included the inauguration of 64 housing units in the illegal settlement of “Har Bracha”, built on Gerizim Mount, south of Nablus city. Great tension is reported to have spread between settlers and soldiers in Yizhar settlement, after the settlers incited attacks against them. According to Al Ray, the army responded by deploying at a religious school belonging to the setters. Al Ray further reports that the army is to open all military camps to settlers. 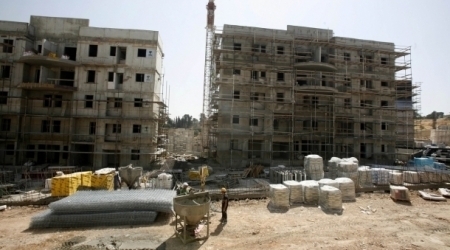 An army spokesperson commented: “The Israeli forces open their camps, at this time of every year, to inform the Israeli public about the operations they conduct"; the brigade is the only one which holds the responsibility of opening the new housing units. 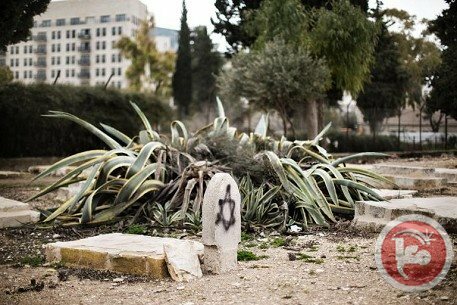 Suspected Jewish extremists vandalized a Muslim grave near the northern Israeli coastal city of Haifa, police said Friday, in the latest in a string of racist and religious attacks against Palestinians. "Graffiti was found sprawled on and around a grave in the Al-Qassam cemetery in Nesher" north of Haifa, Israeli police spokeswoman Luba Samri said in a statement. The red spray-paint graffiti featured the Jewish star of David, the words "price tag" and the names of US Secretary of State John Kerry and Israel's chief peace negotiator with the PLO, Tzipi Livni, she said. For the first time, the US State Department's 2013 Country Reports on Terrorism, published Wednesday, included a reference to a growing wave of racist anti-Palestinian vandalism, euphemistically known as "price tag" attacks. The State Department's 2013 Country Reports on Terrorism cited UN figures of some "399 attacks by extremist Israeli settlers that resulted in Palestinian injuries or property damage". Vandals on Tuesday hit a mosque in the small Palestinian town of Fureidis, near Haifa, and there was also vandalism of Tabgha church on the shores of the Sea of Galilee, where Christians believe Jesus performed the miracle of the loaves and fish. Church officials said a group of religious Jews in their early teens had damaged crosses there and attacked clergy. Israeli President Shimon Peres apologized to the mayor of Fureidis in the name of Israel's citizens, and said in remarks relayed by his office "we will do our utmost to find the perpetrators and bring them to justice". The US report said that attacks by "extremist Israeli settlers against Palestinian residents, property, and places of worship in the West Bank continued and were largely unprosecuted," in 2013. Carried out by suspected Jewish extremists, the attacks target Palestinians and their property, Christian sites and anyone opposed to illegal Jewish settlements. Israel's Islamic Movement condemned Friday's attack on the grave in the cemetery named after Muslim leader Ezzedine al-Qassam, who led fighting against the British and French in mandate Palestine and was killed in a firefight in 1935. "This crime adds to a series of planned and thought-out terrorist acts," it said, suggesting the attackers may have intended to target the grave of Qassam himself. Israeli police on Thursday challenged Washington's inclusion of Jewish extremist attacks on Palestinians in a global terror report, saying such incidents could not be likened to militant attacks. For the first time, the State Department's 2013 Country Reports on Terrorism, published Wednesday, included a reference to a growing wave of racist anti-Palestinian vandalism, euphemistically known as "price tag" attacks. "Attacks by extremist Israeli settlers against Palestinian residents, property, and places of worship in the West Bank continued and were largely unprosecuted," the report said, citing UN and NGO data. But Israel police spokesman Micky Rosenfeld said the incidents were far from the global terror threats outlined in the report. "There's no comparison whatsoever between criminal incidents with nationalistic motives and terrorist-related incidents," Rosenfeld said. The US report noted that "the UN Office of the Coordinator for Humanitarian Affairs reported 399 attacks by extremist Israeli settlers that resulted in Palestinian injuries or property damage. "Violent extremists, including Israeli settlers, vandalized five mosques and three churches in Jerusalem and the West Bank." Defining price tag attacks as "property crimes and violent acts by extremist Jewish individuals and groups in retaliation for activity they deemed to be anti-settlement," the report said that over the year, the phenomenon had spread into Israel from the occupied West Bank. It acknowledged that Israeli police had set up special units to pursue such cases and the government had designated groups responsible as "illegal associations," giving authorities broader powers to act against them. "There are a number of ongoing investigations," Rosenfeld said, saying that four settlers suspected of involvement in a racist graffiti attack on a mosque in northern Israel last month, were taken for questioning on Wednesday and later placed under house arrest. 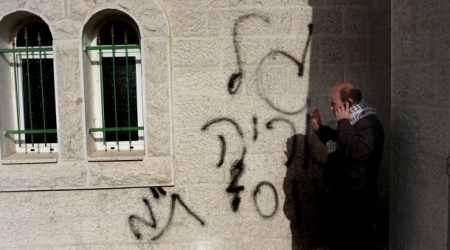 Earlier this week, more racist graffiti was sprayed on the wall of a mosque in Fureidis near the northern port city of Haifa. The town's name means "Paradise" in English. "It is vandalism with nationalistic motives but these are not nationalistic attacks on Palestinians," Rosenfeld said. "You cannot compare whatsoever between terrorist acts, the cold-blooded killing of Israelis, and ... vandalism on that level." Another recent attack targeted shrines at Tabgha on the shore of the Sea of Galilee, where Christians believe Jesus performed the miracle of the loaves and fishes, Roman Catholic officials said. Church officials said a group of religious Jews in their early teens had damaged crosses and attacked clergy. Jewish Israeli vandals, on Wednesday, slashed the tires of eight cars belonging to Palestinians in Nazareth City and occupied the historical city of Acre, where they painted religious symbols on buildings, there. According to local media, settlers punctured the tire of a car owned by a Palestinian contractor from ‘The Industrial Zone’ of Nazareth, before painting the Star of David on it. Nazareth is classified as of the Israeli-controlled Area C territories, which are about 61 percent of the occupied West Bank, according to Al Ray. A recent World Bank report states that Israeli control of this largest area of the West Bank deprives the Palestinian economy of an estimated $3.4 billion a year. The Industrial Zone has seen more than 5 settler attacks this month. 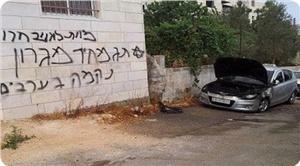 Seven other cars, in different neighborhoods, were also violated in Acre city. A number of extremist Israeli settlers invaded a Palestinian olive orchard, south of the West Bank city of Bethlehem, and uprooted around 50 saplings. Coordinator of the Popular Committee against the Wall and Settlements in the Bethlehem District, Hasan Breijiyya, told the WAFA Palestinian news agency that the attacked orchard is located in Khallet an-Nahla area of Wady Rahhal village. The invaded orchard belongs to resident Issa Ali Zeyada; he told WAFA that the area was recently subject to escalating attacks, and that the attacks included uprooting trees, bulldozing lands and assaults on local villagers. On Wednesday, the villagers managed to obtain a ruling from an Israeli court ordering the settlers to leave the orchard and remove a room they installed. In Hebron, in the southern part of the West Bank, a number of Israeli settlers hurled stones at Palestinian cars driving near Keryat Arba’ settlement, east of the city; damage was reported, but no injuries. In related news, three Palestinians from the al-Khader town, south of Bethlehem, received military orders informing them that the army intends to demolish a shed and a barn. Personnel of the Israeli Civil Administration Department, accompanied by Israeli soldiers, handed the orders to the residents. Coordinator of the Popular Committee against the Wall and Settlements in al-Khader, Ahmad Salah, said the soldiers want to demolish a shed used for repairing and painting cars, and a horse barn. The property belongs to residents Osama Salah, Imad Sarafandy, and Mohammad Da’dou’; they were given 45 days to demolish their structures, and if they don’t, the army would demolish them and send them the bill. 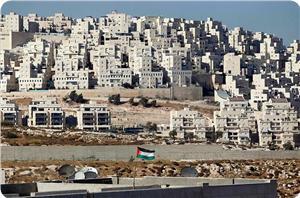 Salah said Um Rokba area is subject to frequent military invasions, and repeated attacks by militant Israeli settlers. Several homes and structures were previously demolished by the army in the area, while several structures have pending demolition orders against them. A Palestinian house and a water well were demolished by Israeli Occupation Forces (IOF) on Thursday morning in Wad al-Baqar in al-Khalil, while several Palestinian vehicles were attacked by a bunch of Israeli settlers. The house owner Muhammad Rajaby revealed in a statement to PIC his unparalleled shock upon catching sight of his house and the nearby water well reduced to rubble by Israeli demolishing apparatuses. Rajaby called on all concerned parties to act so as to halt such demolition processes, and pay him off for all the ensuing upshots of Israel’s thoughtless destruction of his home, his own and only living place. In another event, Kiryat Arba and Kharsina settlers threw stones at several vehicles belonging to Palestinian passers-by in al-Khalil, local sources told PIC correspondent. Such demolition processes and attacks have remarkably increased following the declaration of the Fatah-Hamas reconciliation agreement. The Israeli occupation forces (IOF) at dawn Thursday stormed different neighborhoods of Nablus city as busloads of Jewish settlers arrived at the area where Joseph's tomb is located. Eyewitnesses told the Palestinian information center (PIC) that scores of Jewish settlers on board nine buses escorted by military vehicles entered the eastern area of Nablus and embarked on performing rituals inside the mausoleum of Joseph's tomb. 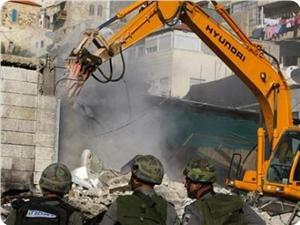 Meanwhile, a number of Israeli soldiers were deployed in wide areas of Nablus, including Balata refugee camp. The invading troops also stormed, amid intensive gunfire, the Old City of Nablus and the neighborhood of Ras Al-Ein and Karoum Ashour as well as the vicinity of Aj'aj Mosque. The intensity of shooting cut power to some neighborhoods. The troops raided several homes, especially in Yasmina neighborhood, and questioned some citizens, some residents said. Other eyewitnesses in Qaryoun neighborhood reported that dozens of Israeli soldiers along with intelligence officers raided homes in their area and fired some stun grenades near Amr Ibn Al-As school. In another incident, the IOF kidnapped 40-year-old Khaled Hashash at a makeshift roadblock in the vicinity of Nablus city, his family said without stating when he was taken prisoner. The family was told by eyewitnesses that Hashash was aboard a car when it was intercepted at the roadblock by Israeli soldiers. The soldiers, then, checked his ID before arresting and taking him to an interrogation center. Israeli soldiers assaulted, On Thursday [May 1, 2014] four Palestinians was working in their farmlands near ‘Aboud village, north of the central West Bank city of Ramallah. Eyewitnesses said soldiers, stationed at a military camp near the village, invaded Palestinian lands and orchards, and violently attacked four villagers causing various cuts and bruises. The four were moved to a nearby medical center; they have been identified as Salah Abdul-Majid, Hussein Abdul-Majid, Waleed Abdul-Majid and Sami Taher. In related news, soldiers invaded the at-Tabaqa village, southwest of the southern West Bank city of Hebron, broke and searched several homes. Local sources said the soldiers closed all roads leading to the village, and surrounded the area before invading the village, and searching several homes causing property damage. Soldiers also closed the main junction of Kharsa village, south of Doura in the Hebron District, and prevented Palestinian cars from using the road that links between various villages and towns in the area. 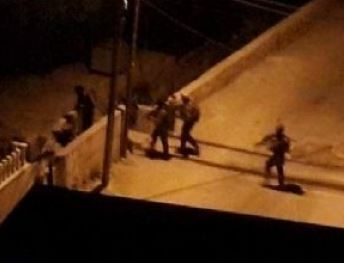 Furthermore, dozens of soldiers invaded various neighborhoods in the Old City of Nablus, searched several homes and interrogated a number of young men. Clashes took place in Ras Al-Ein and Ashour areas after Israeli soldiers invading them; local youths threw stones at the invading soldiers who fired gas bombs, concussion grenades and rubber-coated metal bullets. In addition, clashes took place near the “Joseph Tomb” area, in Nablus city, after dozens of soldiers accompanied hundreds of settlers to the site, and harassed several Palestinians in the area. Israeli Occupation Forces (IOF) attacked on Thursday a number of Palestinian farmers while working in their agricultural land in Ramallah, Palestinian medical sources revealed. The sources pointed out that IOF soldiers brutally attacked four Palestinian citizens while in their agricultural land in Aboud village, north of Ramallah. Israeli forces have detained the four farmers for several hours after being seriously and violently attacked. Ambulance crews were prevented from reaching the injured. The farmers were then transferred to hospital shortly after their release. 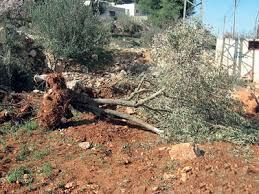 Meanwhile, Israeli settlers uprooted Thursday morning 50 olive seedlings southern Bethlehem. The seedlings were planted by Palestinian activists few months ago over an area of 300 acres. More than 100 extremist settlers raided Wednesday morning al-Aqsa Mosque under Israeli police protection, and started chanting and singing in provocation to Palestinian worshipers, al-Aqsa Mosque's guards said. The guards said that they scuffled with the invading settlers, and Israeli policemen intervened and escorted the settlers out of the Mosque. Israeli occupation authorities have continued to impose tight restrictions on Palestinian worshipers' access to al-Aqsa Mosque for the fourth day in a row, which led to a decrease in their numbers. Meanwhile, Islamic Action Front (IAF) party in Jordan warned of attempts to recognize Israeli sovereignty over Jerusalem. In a statement on Wednesday, the Islamic party stated that organizing "Road to Jerusalem Conference" in Amman aims to issue a fatwa (edict) authorizing Arabs and Muslims' visits to occupied Jerusalem. An earlier fatwa that prohibited Arabs and Muslims' visits to Jerusalem while under Israeli occupation had managed to limit normalization with Israeli authorities, the party pointed out, adding that re-considering this fatwa should be under Islamic scholars' collective supervision. Hebrew media sources revealed blatant calls by Israeli army and a horde of extremist settler groups urging settlers to partake in the inauguration ceremony of a new suburb in Har Bracha settlement built on Palestinian lands south of Nablus. According to the Hebrew Haaretz online newspaper on Wednesday, the inauguration ceremony, sponsored by the so-called Israeli Samaria Brigade army branch and Samaria Regional Council for Settlement north of the Occupied West Bank, is due to be held next week. Other movements active in Israeli settlement expansion will also join the ceremony to celebrate the illegitimate construction of around 64 residential units over a set of lands that have historically been Palestinians’ own and exclusive property. The Israeli leftist Peace Now movement, active in anti-settlement affairs, revealed in a report published on Tuesday that during the nine-month-long Palestinian-Israeli peace talks, officially suspended on 29 April, Benjamin Netanyahu’s government has hit a new record high of 1,3851 new settlement units . According to Haaretz newspaper, the invitation came as part of the purported “independence” festival expected to be held in cooperation with Israeli settlers, who welcomed the decision as a proof of the army-backed sponsorship of Jewish settlement venture despite international pressures and calls to bring such illegal activity to a halt.